Carports or car shelters are a necessity for those who want a temporary setup to park their car safely from the elements or for those who are looking to save space. There are various types and varieties of these available in the market right now and we have chosen a handful of them for your convenience. All their features and benefits have been listed out below and you can choose whichever fits your requirement accurately. Let us have a look at the best car shelters and carport out there through this article. This 10 feet by 20 feet carport is a perfect shelter for your vehicle to protect it from the elements. 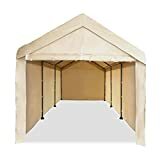 This six pole shelter is easy to set up and has a long durability. This shelter which provides a 200 feet area of total shelter has canopy made of special UV protecting material which ensures that the various issues of parking your car out in the sunlight are completely avoided while keeping the interior cool as well. The frame of the material is made with powder-coated sturdy steel to avoid rusting or deterioration of the material. The various features of the shelter from Caravan have been listed below. This car tent from Reliancer has a truly innovative design which allows you to carry it around and provide protection for your car from elements anywhere, anytime. This semi-automatic umbrella is provided with double suction cups and multiple straps to make it remain fixed and rigid. Anti-theft straps are also provided so that you will not have to worry about leaving it on the car. The material used is completely polyester which ensures durability and special UV protection layers ensure that 99% of UV rays are avoided and the design also allows ventilation of air, making the interior remain cool. 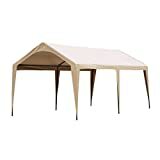 The features of this tent from Reliancer have been listed below. Caravan Canopy sidewall kit is not a car tent on its own but is more of an add-on for the Caravan Canopy. This kit includes 4 sidewalls with one of them having zippers for easy entrance and exit from the tent. This additional kit has been made available for all round protection for your vehicle and to provide maximum privacy. The water-resistant material that the canopy has been made of will ensure that even in slightly harsh conditions, your vehicle is protected from the elements. One must understand that the frame or top of the shelter is not included and will have to be purchased separately. The features of the Caravan Canopy Sidewall Kit has been listed below. This product from Abba Patio is built with a sturdy powder coated steel frame which ensures that even in the harshest condition, the shelter stays stable. The polyethylene material that is used to build the canopy is water resistant and protects your vehicle from the elements. The 360-degree protection is perfect for all weather conditions regardless and keeps the interior of your vehicle cool. This product is available in various sizes and can be chosen according to your vehicle’s size. The various features of Abba Patio Car Shelter have been listed below. This heavy duty carport from Abba Pato is available with a dimension of 10′ by 20′ which makes it perfect for all types of vehicles. Built using heavy duty materials, the car shelter can withstand the harshest of weather without any hassle. Built to last and protect, this product can be your go-to carport if you live in an area where the climate is unpredictable. Sold with all additional requirements like anchors and high-quality frame, this product is your one stop solution. 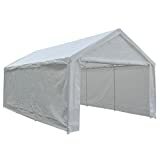 The various features of Abba Patio heavy duty car shelter have been listed below. Ikuby’s heavy duty car shelter comes with a unique design which allows easy usage and great protection. The product weighs a total of 170 pounds which on itself explains how durable and weatherproof the product is. Easy to install and use, the product is quite easy to maintain as well. Water resistant and UV protection are guaranteed by the company and external factors can cause no damage to your vehicle whatsoever. Built to withstand even the strongest of winds, this product can definitely be your answer if you are looking for a high-quality product while you want to save space. The product has even survived a hailstorm test and that proves how good this innovative product is. Various features of Ikuby heavy duty car shelter have been listed below. This 10 feet by 20 feet heavy duty carport from Vingli is a roof only protection from sunlight. The frame is built of high-quality materials which guarantee the stability and durability of the product. If you are looking for all-around protection for your car, all you will have to do is buy additional side wall. 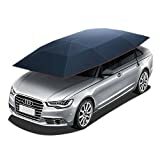 The canopy material is 100% waterproof and also protects your vehicle from UV rays. The frame comes with a total of 6 legs for superior balance. The various features of Vingli carport have been listed below. 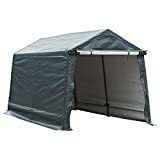 This 12 feet by 20 feet carport from Abba Patio is your solution for car shelter if you are looking to protect an SUV or a big car or even if you just want a spacious carport. Built with 8 leg frame to provide greater stability this product can be used t home or even at events. The fact that the side doors are also detachable besides the front zipper door makes it great for exhibitions. Anchors are also provided with the product to secure it onto the ground. The various features of Abba Patio heavy duty carport have been listed below. This 10 feet by 20 feet product from Abba Patio has been built utilizing sturdy materials for the 6 legs that have been used to form the frame. Double polyethylene canopy it is provided with ensures that your vehicle is protected against the worst weather conditions. 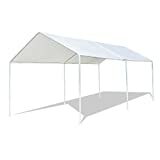 The structure is easy to set up and high-grade bungee cords are also provided to secure the canopy on to the frame. Various features of this product have been listed below. These are some of the best carport options you have available in the market. Take a deep look at the list, analyze your requirements and buy an option that suits them. We have put in a thorough research for this and hope we have done a work which has answered your questions.